Turkey's Supreme Election Council (YSK) on early Monday announced President Recep Tayyip Erdoğan won absolute majority in presidential election as 97.7 percent of ballot boxes were opened. 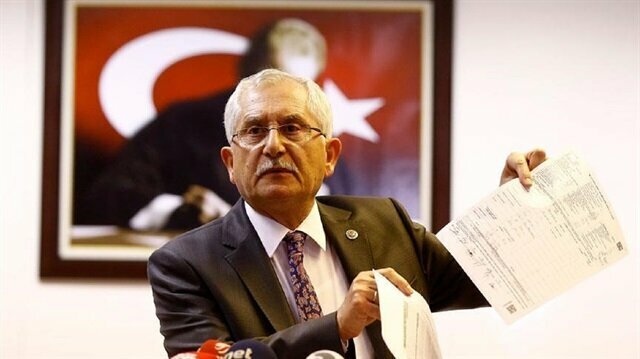 Speaking hours after Sunday's presidential and parliamentary elections, YSK head Sadi Güven said Justice and Development (AK) Party, Republican People’s Party (CHP), Nationalist Movement Party (MHP), Peoples’ Democratic Party (HDP) and Good (IYI) Party surpass 10 percent threshold in the parliamentary election. Sadi said the remaining uncounted votes will not affect election results. His ruling AK Party is also leading in parliamentary elections, with 42.4 percent of the vote counted. Along with the MHP, the AK Party’s election ally, the People's Alliance has won 53.6 percent of the vote so far. Democracy is the winner of Sunday's presidential and parliamentary elections, President Recep Tayyip Erdoğan said early Monday.Addressing the nation from the balcony of Justice and Development (AK) Party headquarters in capital Ankara after his election victory, Erdogan said every one of the 81 million Turkish citizens is a winner. "Winners of June 24 elections are Turkey, Turkish nation, sufferers of our region and all oppressed in the world," he said.Video: Supporters gathering to celebrate President Erdoğan's victoryHe also thanked Nationalist Movement Party (MHP) leader, members and voters. "I would like to express my gratitude to my people, my brothers and sisters who put their trust in me, my alliance and my party," he said.Erdoğan declares victory in elections, says no walking back on Turkey's progressTurkey’s ruling AK Party calls on political parties to ‘respect election results’Erdoğan pointed out the benefits of forming alliances in the elections. "As you see, this [alliance] has become beneficial both for other [political] parties and our country. "Earlier on Sunday, Erdogan declared his success in Turkey's historic presidential and parliamentary elections.AK Party is also leading in parliamentary elections. Along with the MHP, the AK Party’s election ally, the People's Alliance has won majority of the votes so far.The president said he received the citizens' message in the polls. "In this term, we will be before our nation and make up for our shortcomings. "Starting from tomorrow, we will be in a rush trying to deliver on promises that we have made to our nation. "He also said his government would confront terror groups more decisively. "We will increase our country's international reputation," he added. "Immediately after the oath-taking ceremony, we will start implementing our program by identifying our bureaucrats," Erdoğan said, vowing to work day and night as "we have no single moment to lose. ""Turkey has decided to take the side of growth, development, investment, enrichment and a reputable, honorable and influential country in all areas in the world," Erdoğan said. Turks abroad on Sunday night flocked to streets after Recep Tayyip Erdoğan’s presidential election success.In Belgium's capital Brussels, Turks celebrated Erdoğan’s success in Turkish-populated neighborhoods such as Chausee and Haecht streets.Members of Union of International Democrats, formerly known as Union of European Turkish Democrats, took part in the celebrations.GermanyTurkish citizens in Germany also showed their enthusiasm and gathered on one of capital Berlin's busiest street Kudamm.They were chanting slogans such as "Turkey is the best" and "Recep Tayyip Erdoğan".Also gathering at Kerpen town near Cologne city, supporters of AK Party celebrated the victory.In Berlin's Schoneberg district, Turkish citizens gathered around AK Party's election monitoring center and followed the outcome of the elections there. Later, they gathered on Kurfurstendamm street to celebrate the results.AustriaTurks also celebrated Erdogan's victory in Austrian capital Vienna.The Turkish citizens filled a conference hall to follow the election and started celebrating once Turkey’s Supreme Election Council lifted the ban on publishing election results after polling ends.They were waving Turkish flags and singing songs to celebrate Erdoğan and his party’s victory.Galeri: Turkey celebrates Erdoğan, AK Party election successSwedenAKParty’s supporters in Sweden followed the elections in party's Stockholm Election Coordination Center.Waving flags of Turkey, AK Party and Nationalist Movement Party (MHP), Turkish citizens went to their country’s embassy building in Stockholm to celebrate Erdogan’s victory.During celebrations, Ambassador Emre Yunt joined Turks and spoke to Anadolu Agency, wishing well to the country in Erdogan’s next term.Also, AK Party's Election Coordination Center head Ozer Eken said democracy is the winner of the elections.Thanking his team and supporters, Eken said AK Party worked in Sweden to increase the voter turnout.United KingdomMore than 200 Turks celebrated in the streets of London following the release of unofficial election results that showed President Recep Tayyip Erdogan success.Supporters in London’s Hyde Park chanted slogans in support of Erdogan and his AK Party. They also danced and sang Turkish songs.Members of the Union of International Democrats and the Newcastle-based Fikri Asim Association, two organizations representing Turks in the U.K. and Europe, also joined the celebrations.AzerbaijanIn Azerbaijan, Turkish citizens gathered near their country’s embassy in Baku. Following the announcement of the unofficial results, they flocked to Ataturk Park.Chanting Turkish National Anthem in front of a monument in the park, people waved flags of Turkey, AK Party and MHP.Later, the AK Party and MHP supporters toured the city streets.Bosnia and HerzegovinaThe election success of Erdogan was also celebrated with enthusiasm in Bosnia Herzegovina's capital Sarajevo.Hundreds of people -- including Bosnians, Palestinians, and Ghanaians, as well as Turks living in Sarajevo -- gathered in historic Bascarsija district after they had a city tour in their vehicles.Those carrying the Turkish and Bosnian flags celebrated Erdogan's electoral success by chanting slogans.PakistanThe Turks and Pakistanis, who gathered in the G-6 sector of capital Islamabad, toured the city in a convoy.Citizens taking victory tour around the city with Turkish and Pakistani flag, met in front the Faisal Mosque, which is one of the symbols of the city, and chanted pro-Turkey and pro-Erdogan slogans.The convoy of 25 cars and 10 motorcycles was accompanied by the Pakistani police and hailed by the passers-by.SudanAfter the election results, the Turks living in Sudan made a convoy to celebrate the victory in the streets of the capital Khartoum, where the Sudanese also showed support.The crowd gathering in front of Turkey's embassy building chanted slogans in favour of Erdogan.MacedoniaA large number of people residing in Skopje gathered in front of the Murat Pasha Mosque in the Old Turkish Bazaar, which was adorned with Turkish flags and Erdogan’s posters, to celebrate the election results.The tradesmen of the bazaar served Turkish dessert baklava to hundreds of people, including Turks, Albanians and Bosnians who attended the victory celebrations.People also celebrate the victory in northwestern city of Gostivar.KosovoHundreds of citizens in Prizren city of Kosovo flocked to the streets, chanting slogans "Kosovo is proud of you", and "Don't bend, Kosovo is with you.”The citizens carrying posters of Erdogan and flags of Albania, Kosovo and Turkey toured the city.AlbaniaIn the capital city of Tirana, the citizens holding flags of Turkey and Albania celebrated the outcome of the elections.The students studying in Turkey also attended the celebration and expressed support for President Erdogan.NetherlandsTurkish citizens living in the Dutch city of Rotterdam gathered in front of the Consulate General of Turkey with Turkish flags and celebrated Erdogan’s victory.FranceTurkish citizens living in France came together at associations and work places and followed the results.With the announcement of the first results in the city of Strasbourg, the citizens in long convoys met in front of the European Parliament (EP) after a joyful city tour.Celebrations also took place in the cities of Paris, Lyon, Mulhouse, Marseille, Bordeaux, Toulouse and Lille.QatarA Qatari national served dessert to mark the victory of Erdogan in capital Doha's one of the touristic spots Souq Waqif.LebanonHundreds of Turkish and Lebanese citizens celebrated Erdogan's success with a convoy of hundreds vehicles in Lebanon's Tripoli and Nabatieh cities.In Beirut, a large number of people gathered at a cafe in the west of the city and followed the election results.